Hassle-free EMS recertification for busy professionals on the go. Our Distance CME™ solution provides the live, high quality education your providers need to stay certified, no matter where they are or what time of day. With more than 600 hours of live training offered around the clock, your EMS providers can choose courses that work with their schedules. Live and interactive, our EMS courses meet all didactic requirements. They are designed for paramedic/AEMT, EMT/EMR, critical care, fire fighters, flight nurses and more, covering topics ranging from ACLS to pediatric to obstetrics. Your providers won’t miss valuable work or personal time, because we offer classes frequently and around the clock to conform to their schedules, not ours. Our mobile-friendly online courses eliminate unproductive travel time, reduce travel-related expenses and can be taken anywhere with an internet connection. 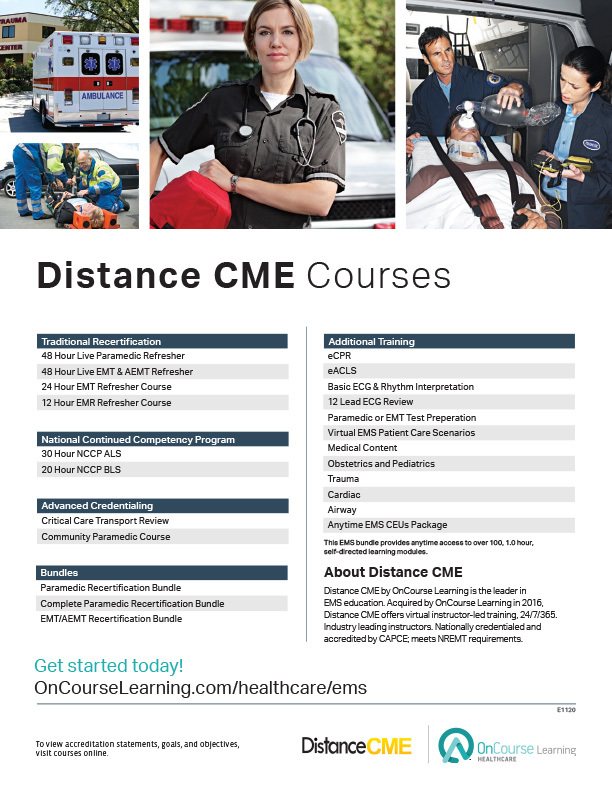 Every Distance CME course is taught by subject matter experts who bring their unique life experiences to the classroom. Each instructor has practical experience in areas such as international deployments, military, disaster teams, critical care and research that add authority to their presentations.